Though the majority of brands activating at last fall’s three-day Food Network New York City Wine & Food Festival presented by Food & Wine were food and beverage products, there were a couple of non-endemic brands that took a seat at the table, too. All turned out to take their best shot at connecting with the tastemakers, and generally higher income consumers that can afford to shell out $195 a pop for a ticket to the Grand Tasting—just one of several paid experiences that were part of the festival. We spent the day at Chelsea Piers making our way down the aisles for a taste of not only the edible brand activations, but the non-edible, too. And then we checked out some of the off-site activations that paired themselves up with the festival’s foodie extravaganza. 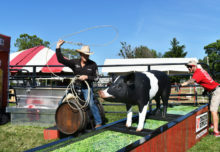 Here, we give you a taste of the action and our top picks for best in show. Our pick for best in show at the festival was Constellation Wine’s Ravenswood Sonoma County-inspired booth, which stood out among the rows of wine tasting tables even from a distance with suspended panels designed to look like raven silhouettes that cast featheredshadows on the raw floorboards of the booth. The exhibit harked back to the brand’s tasting room in the Mayacamas Mountains with rugged wood boards repurposed from a barn in Missouri. For more of that weathered finish it used rusty nails and wrought iron décor,including an old army cot turned photo installation. Attendees were prompted to have their photo taken by staffers dressed all in black with dangling raven-inspired feather earrings. The photos were instantly printed so that consumers could write a message about what rebellion means to them. The theme tied to the brand’s legacy of “ruffling some feathers,” a play on its raven logo and a history of “screwing with tradition,” like using the Zinfandel varietal when it wasn’t popular to do so. The pictures were then clipped onto the cot. The installation was to travel back to the brand’s tasting room in California for display. The effort was part of the brand’s re-launch as it returns to original, authentic blends (Old Vine and Est 1976 bottles) in its Vintners Blend tier. Other cool details included custom pillows for the seating area with “rebellious” sayings on them, such as “We’re not averse to change, just conformity.” Ravenswood also had on-hand its founder, winemaker and industry icon, Joel Peterson, to share his stories and sign a branded poster as a gift to consumers. Think beer and wine don’t mix? Constellation Wines begs to differ. Agency: Grand Central Marketing, New York City. 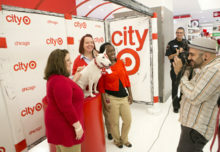 We were thrilled to see a non-edible brand come out with a full-on activation. 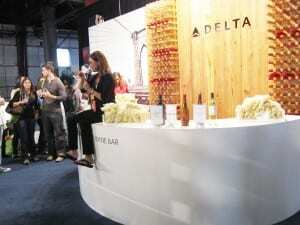 Delta recreated its Skybar on-site with a sophisticated bar and lounge area to show off the comfort its airline has to offer. 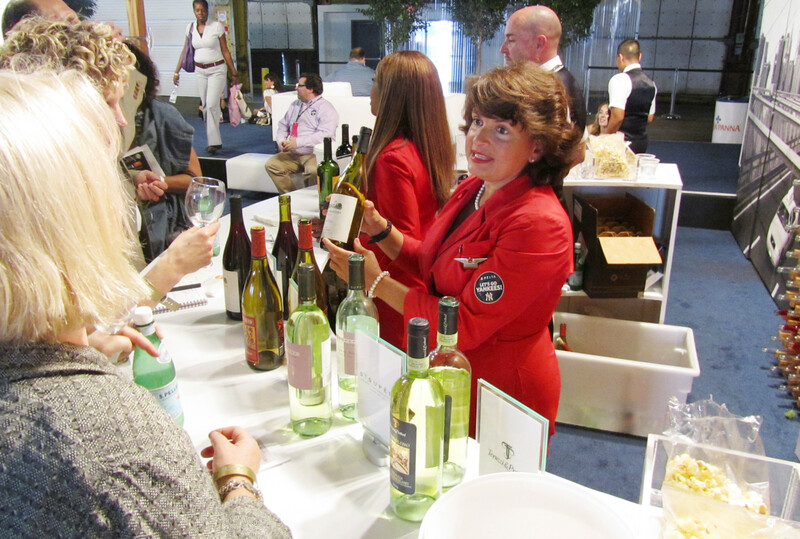 Select members of its flight crew served red and white wines behind the bar as well as champagne. A light wooden wine rack stocked with empty clear andburgundy-colored glass bottles served as the backdrop. The brand hung recipe cards for the taking with “Culinary Creations from Delta Chefs,” like celebrity chef Michael Chiarello on a vineyard trellis-inspired wooden centerpiece. It also treated consumers to a live pairing session hosted by celebrity and Delta sommelier Andrea Robinson who drew in a crowd with her casual and spunky approach, which she delivered sitting atop the bar. Delta also drove consumers to its Facebook page with a Biscoff Bakeoff that people could participate in by creating recipes using the cookies and then posting them on Delta’s Facebook page for a chance to win a trip to Napa Valley. Peppered throughout the footprint were flight memorabilia in clear cases and airplane chairs that consumers could test out. Staffers walked the footprint with iPads to encourage visitors to register to receive more information about Skymiles (or sign up on the spot) and enter to win a flight for two. Delta’s spacious lounge area was a blessing, especially at a show where people walk around with napkins overflowing with food and glasses brimming with wine. There were other brands that offered up comfortable seating areas, but that’s all they did (Agency: MKG, New York City). Like our top two picks, Welch’s really stood out. And despite being in an extremely crowded area of the show floor, like Ravenswood it evoked the serenity of the vineyard. 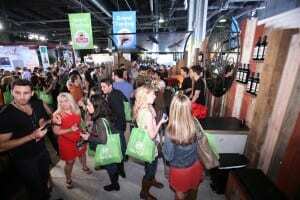 It was also the most whimsical booth at the Grand Tasting. The brand set up two tasting stations—one for its purple grape and another for its white—with giant inflatable purple grapes in the backdrop as well as a whole harvest-time vineyard theme brought to life (sounds corny but wasn’t, honest). It was playful and full of engaging elements, such as a video on a loopeducating visitors about how Welch’s 1,150 family-farmer/owners plant, care for, and harvest Welch’s Concord and Niagara grapes. 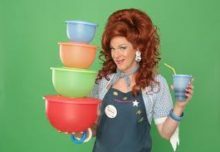 There was also a “What’s New” section where it introduced consumers to the brand’s new Welch’s Fruit Fizz and a central photo activation that had visitors posing with props like grapes on the vine, hats and boas. 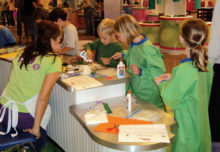 The photos were printed on-site as well as emailed to consumers with an option to directly share with friends and family on Facebook and Twitter. It also used Twitter to drive consumers on the show floor to its booth to taste its product and grab a copy of Welch’s “Taste the Harvest Guide,” a partnership with Zagat that created the first-ever guide on how and where to eat locally and seasonally (You can download the guide at welchs.com/zagat). It would have been nice to sit a bit to take it all in, maybe a bar with stools given the space constraints. Yet there were plenty of useful takeaways (the guide and photo) to extend the engagement. Bonus: Non-wine drinkers could fill their festival-branded glass with Welch’s juices and play along (Agency: Eventive Marketing, New York City). Before attendees could even set foot inside the Grand Tasting, they had to visit the Illy experience at the park across the street. Though arriving at the entrance to Pier 57 where the event was held only to find out we had to return to the park to get our official wristbands was a nuisance, it was also a clever move. 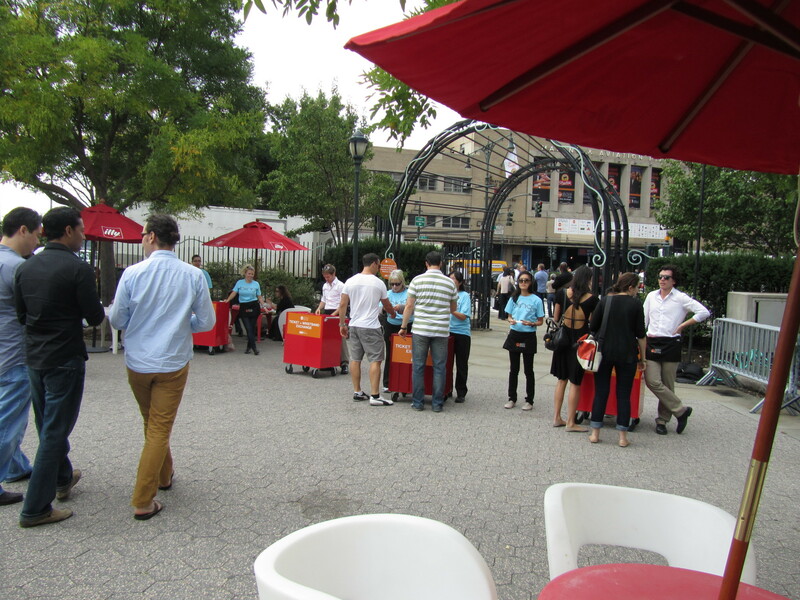 The park was an Illy-branded playground with the exception of some Food Network seating areas and an Entwine wine tasting booth. There were staffers handing out cans of Illy’s chilled espresso offerings, as well as espresso stations pumping out caffeinated goodness from its capsule system machines. Once folks had their wristbands they could come and go and take advantage of cushions and café style seating arranged throughout the space. After a few free espressos, the initial inconvenience was history. 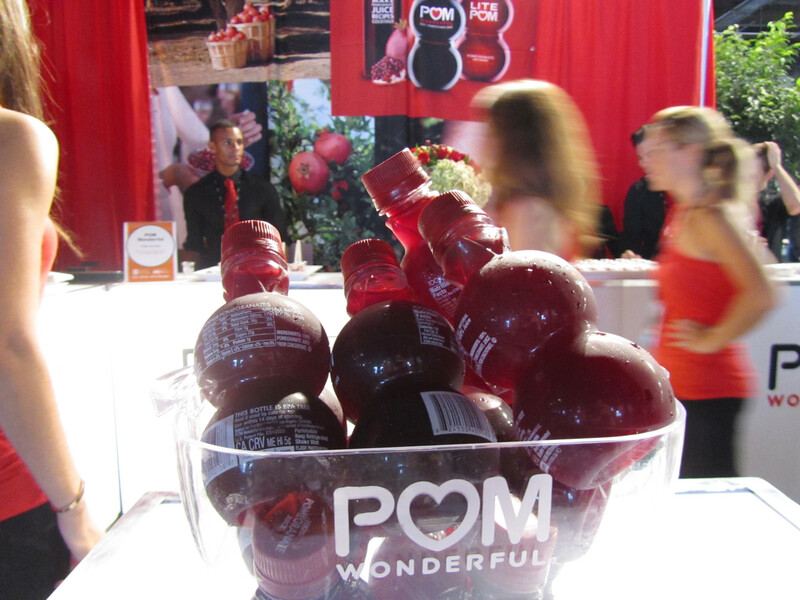 Pomegranate beverage brand POM could have benefited from a lounge area to complement its romantic and inviting red-toned décor. It gets points for creative sampling—rather than serving the juice in cups, it concocted a POM-inspired sorbet that included Pomegranate seeds in it. The staff was super friendly and if there had been a seating area and more interactives, it might have been worth sticking around for a second sorbet. Amid a sea of frozen and canned food offerings disguised as “gourmet” in the ShopRite section of the show floor, Alexia’s brand of frozen foods was a respite off to the side with three family-style wooden tables where guests could sit and enjoy onion rings (not very gourmet either, but decent) and potatoes hot from the oven in a small kitchen manned by “chefs” poring over endless trays of food. On top of the tasting tables the brand arranged dainty white bowls with lemon wedges, grated cheese and such, to represent its foods’ various flavors. 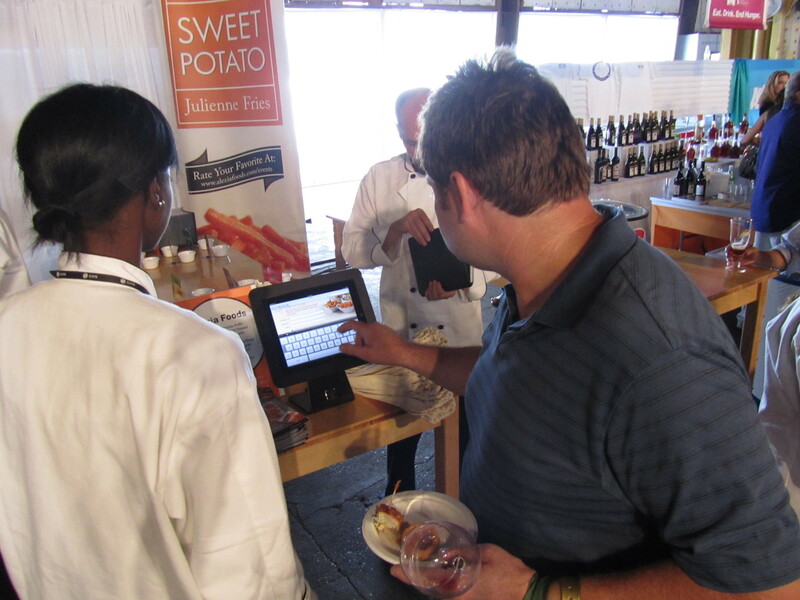 Staffers intercepted attendees to sign them up for the brand’s newsletter on an iPad and rewarded them with a tote bag and recipe brochure. They could also stick around for cooking demos every half hour. Nice touch: There was someone constantly cleaning the tables after the hordes of people that stopped by (Agency: Team Epic, Columbia, MD). 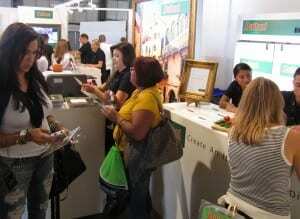 Buitoni’s booth was a bit like high-heels—they look good but are pretty uncomfortable. The booth was attractive with its white and gold palette, and there were always long lines of people trying to get their hands on either the seafood or mushroom ravioli. But there were only two very small cocktail tables to snack at, each topped with a bag of product nestled onto a gold pedestal (space to set a plate would have been nicer). A big booth draw was the fire red Vespa where folks could sit and have their picture taken against an Italian streetscape. The photos were printed on-site and placed in a golden frame that embodied the opulent theme. There were also matching frames around flat screens showing Buitoni cooking demos and the brand’s Twitter feed. Buitoni also sponsored a separate activation called “Three Amigos” featuring Food Network chefs Melissa D’Arabian, Aarti Sequeira and Jeff Mauro (Agency: Mirrorball, New York City). Microsoft’s signature search engine not only got its name on festival staffers’ t-shirts and the entry wristbands, it also had an experience that despite its tiny size, lured in plenty of people. 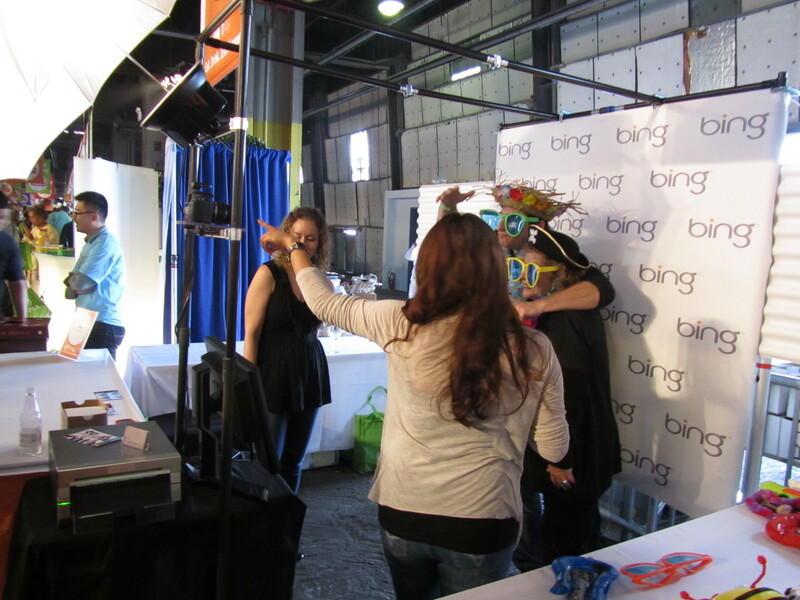 It was a photo activation that had attendees posing with all sorts of masks and props like giant sunglasses and boas. A camera captured the fun on a screen and then the picture was printed on-site. It was set up right as folks entered the festival and was a smart way to grab people while they were totally psyched and hadn’t yet been taken over by a food coma. It’s no surprise that Thrillist, which emails subscribers daily with recommendations about the best food, drinks, services, entertainment and travel options in cities across the U.S., knows how to throw a party. 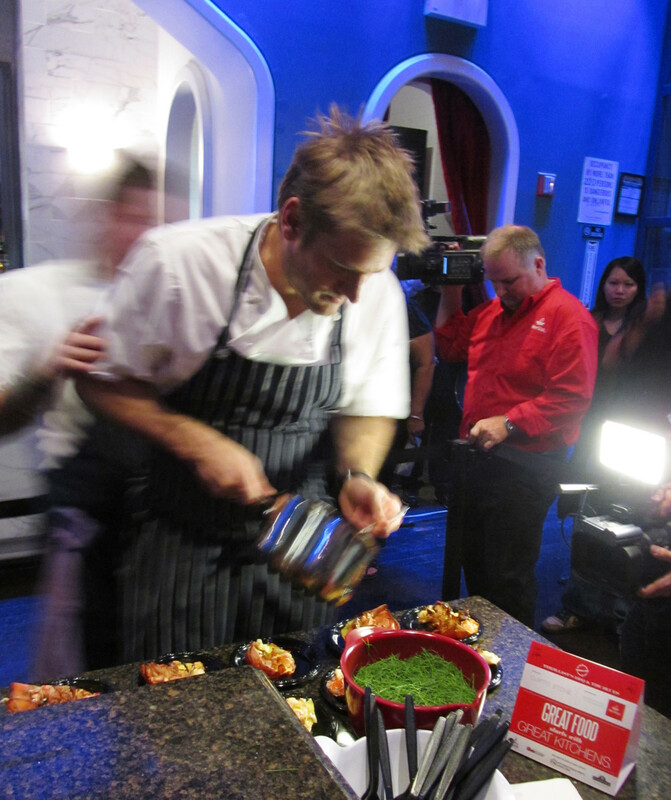 The Thrillist BBQ & the Blues event sponsored by kitchen and cabinets brand Merillat and hosted by Australian celebrity Chef Curtis Stone, was one of the nightly events scattered throughout the city during the festival. The bash took over two floors at the Hudson Terrace on 46th Street between 11th and 12th avenues, the same block where the famous Daisy May’s BBQ is located. The restaurant was one of 11 other restaurants showcasing their best barbeque at the event. On the first floor attendees were greeted by representatives from whiskey brand Michael Collins, which concocted drinks for the night and then tasked folks with texting their favorite cocktail to a specified code for a chance to win the Michael Collins Irish Whiskey bicycle that was on display. This floor had an upscale flair with crystal chandeliers dangling from the ceiling as Chef Stone serving up decadent barbequed lobster below. Restaurants showed off their succulent barbeque creations, such as SushiSamba with a buttery pork belly and Dinosaur Bar-B-Q with a pickle-infused pulled pork sandwich. The centerpiece was a Merillat dream kitchen. There were also Coors Light girls dressed in silver and white fur dresses handling buckets filled with cool brewskies. The second floor was less crowded and more casual with folks trickling in to sample additional restaurant fare and listen to a live New Orleans-style Jazz band. There was a third bar, too, and a giant flat screen airing Merillat footage. The event was so hot there was a block-long line at the door, plus folks holding up cardboard signs with messages begging ticketholders for a chance to get inside (Agency: Eventive Marketing, New York City).